We have missed our friends! Here is a little something to keep you company. It is Friday here at Squirrel Point Farm and time to clean out the fridge from this week’s experiments…uummm…meals. So tonight we are having our own creation of Vegetable Medley Soup. The carnivores have devored any meat we have had with meals. We have decreased our meat portions and increased our veggies. So we have veggies left over from the week and a few that haven’t been processed into the freezer for use later that really just need to be eaten. 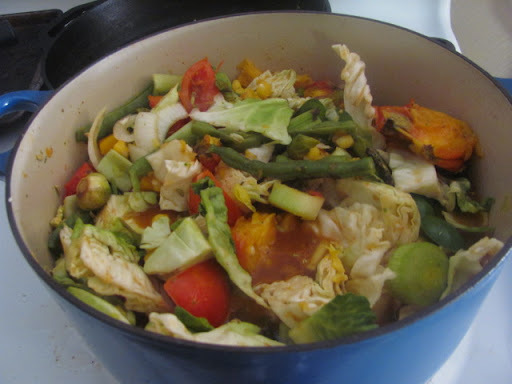 Chop up fresh (wilted) veggies and toss in to a large stock pot. Toss in rest of ingredients. Lower heat to and let simmer for 30 minutes. Serve with grilled cheese on the side. Our soup tonight included asparagus, Brussels Sprouts, cabbage, butternut squash, leek, onion, garlic, chili powder, hot sauce, tomatoes, green beans and I used a nice red cooking wine. The kids asked for a little kick to it hence the hot sauce and chili powder. Get crazy, get funky but use up those veggies for some warm goodness.